(Pace Gallery); purchased 1977 by Eugene Thaw; gift 1991 of Mr. and Mrs. Eugene Thaw to the NGA. Provenance according to Art for the Nation : Gifts in Honor of the 50th Anniversary of the National Gallery of Art, Exh. cat., Washington, 1991: 454-455. Lee Krasner: Eleven Ways to Use the Words to See, The Pace Gallery, New York, 1977, unnumbered catalogue, repro. Lee Krasner: A Retrospective, Museum of Fine Arts, Houston; San Francisco Museum of Modern Art; Chrysler Museum, Norfolk; Phoenix Art Museum; Museum of Modern Art, New York, 1983-1985, fig. 152. Lee Krasner Collages, Robert Miller Gallery, New York, 1986, unnumbered catalogue, repro. (unpublished checklist, no. 14). 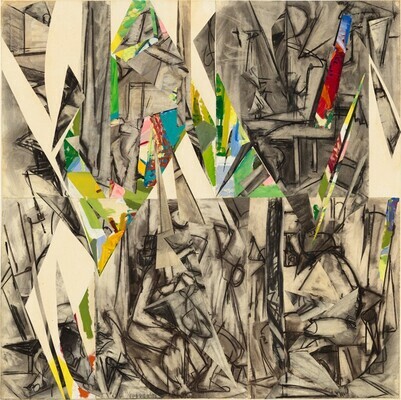 Lee Krasner, Los Angeles County Museum of Art; Des Moines Art Center; Akron Art Museum; Brooklyn Museum of Art, 1999-2001, pl. 91. Cavaliere, Barbara. "Lee Krasner." Arts Magazine 51 (April 1977): 26. Kusp, Donald B. "Lee Krasner at Pace." Art in America 65 (November-December 1977): 136. Prown, Jules David, and Barbara Rose. American Painting From the Colonial Period to the Present. New York, 1977: 248, repro. 249 (same text as Rose 1980). Rose, Barbara. "Lee Krasner and the Origins of Abstract Expressionism." Arts Magazine 51 (February 1977): repro. on cover. Rose, Barbara. American Painting: The Twentieth Century. New York, 1980: 130, repro. 131 (same text as Prown and Rose 1977). Vetrocq, Marcia E. "An Independent Tack: Lee Krasner." Art in America 72 (May 1984): repro. 145. Art for the Nation: Gifts in Honor of the 50th Anniversary of the National Gallery of Art. Exh. cat. National Gallery of Art, Washington, 1991: 454-455, color repro. Wagner, Anne Middleton. Three Artists (Three Women): Modernism and the Art of Hesse, Krasner, and O’Keeffe. Berkeley, 1996: color pl. 19.